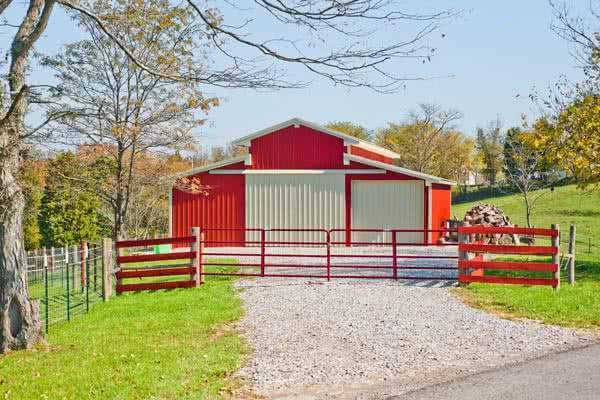 You are here: Home / FAQ / How Much Does a 2 Stall Barn Cost? There are many variables for building a barn, the most obvious: what it will be used for. For example, do you want a hay loft in your two stall barn? Will you be stabling horses in your barn or cattle? Will you also be storing equipment in this barn? What about feed? How large are the horses if it’s a horse barn? For example, Clydesdales need more room than almost any other breed. If this barn is for cows, will you be milking them here? Do you need a wide center aisle as a pass-through with stalls either side? You will need to do some thinking and some list-making about what you’ll use your barn for before you can decide how much space you’ll need, what kind of accessories you’ll want, and how you want the space configured. 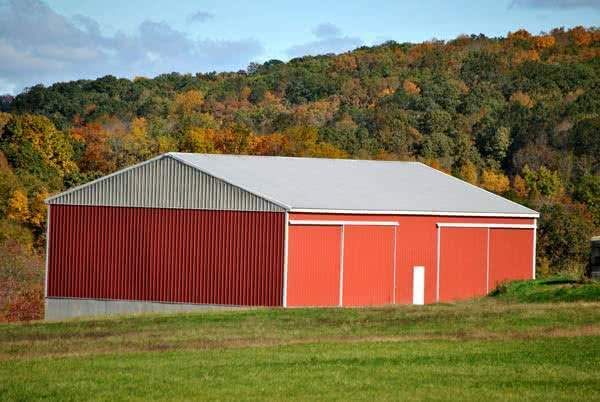 The base cost of building a prefab steel barn varies from $4 to $22 per square foot, with larger structures generally costing less per square foot. The final cost is dependent on a number of factors, including the location of the building site and details such as insulation and the number of doors & stalls in the barn. A 2 stall barn with an aisle should measure about 30′ x 40′. This allows for large 14′ x 14′ stalls and an aisle that is at least 14 ft wide. 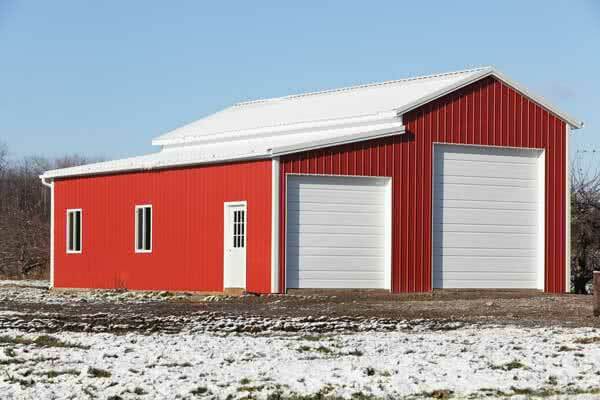 A straight wall steel barn with these dimensions has a base price of about $10,800. The estimated cost of accessories and delivery is around $2, 900, for a total approximate cost of $13,700. 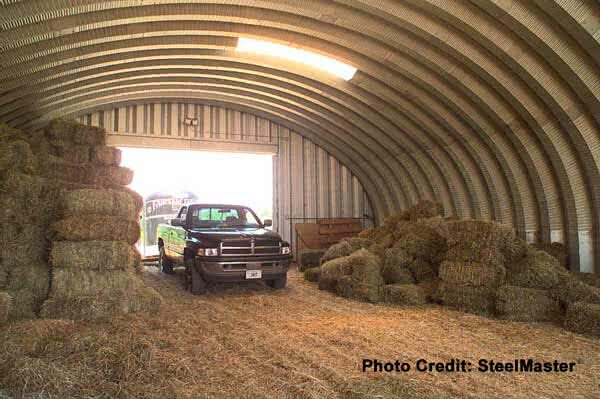 A steel barn with a Quonset design will generally cost 30% less than a straight wall design, though there are some limitations in the width of Quonset designs (see our building designs page for more details). A 30 ft by 40 ft Quonset Hut style steel barn has a base price of approximately $9,000. With accessories and delivery costing about $2,520, the total approximate cost for a Quonset design is $11,520. One of the major advantages of prefabricated steel barns is the significant savings they offer in constructions costs. Prefabricated barns are ready to assemble when shipped and can be bolted together by a small crew. The $35 to $45 cost per square foot of traditional construction can be greatly reduced. Recruiting a group of friends to help with assembly can eliminate construction costs for a prefab steel barn.